This page will explain what we have discovered about how to use this interesting little device. SET V0 TO GETVOICE(0). // Gets a reference to the zero-th voice in the chip. V0:PLAY( NOTE(400, 2.5) ). // Starts a note at 400 Hz for 2.5 seconds. // The note will play while the program continues. PRINT "The note is still playing". PRINT "when this prints out.". Below we describe, to the best of our knowledge, the sound capabilities of the SKID chip. Further below after this section, we’ll describe the programming interface we’ve added to Kerboscript to let you access these abilities. For now, don’t think about how to access these abilities, just look at what they are. The SKID chip contains up to 10 simultaneous “voices” that can emit sounds together. (The voices are numbered 0 through 9). Each of these so-called “voices” can be set up with a particular set of sound settings, which is like defining the properties of its “instrument” . Then it can be told to play one or more notes using that set of settings. Please don’t be fooled into thinking these actually sound like Kerbals speaking just because we called them “voices”. They’re just electronic bloopity-blopity sounds. The SKID chip appears to be capable of producing sounds in the range of as low as 1 Hertz (not like you’d ever hear that) and as high as up to 14000 Hertz. Most people can hear higher notes than that, but the chip’s notes start to get a little distorted at those frequencies. At any rate, this range is plenty high enough to hear the entire range of a piano’s 88 notes, and then some. The SKID chip can put out any range of volume levels between 0.0 and 1.0, within the accuracy of floating point numbers. It is noted that it can also amplify the volume to levels higher than 1.0, to boost the signal when needed, although this feature is not well understood. Each voice can be set to one of several possible sound waveform patterns. As of this writing, our engineers have uncovered 5 such wave forms, displayed here. These each produce a slightly different sound. "SQUARE": When this :WAVE setting is used, the sound is very electronic, and “beep”-like. This is also the default wave a voice starts off with if you never changed the setting. "TRIANGLE": When this :WAVE setting is used, the sound is sort of halfway between sounding electronic and sounding mellow. "SAWTOOTH": When this :WAVE setting is used, the sound is a little bit like a rasping wasp. "SINE": When this :WAVE setting is used, the sound is a mellow and smooth tone, which also ends up seeming a bit quieter because of the smoother edges. "NOISE": When this :WAVE setting is used, the sound is like random static on a walkie-talkie. The SKID chip will play a note in the background unattended while the CPU continues with its work. Thus you don’t have to have the main program pause while it plays a note. The ADSR envelope shown graphically. When a natural analog instrument plays a note, there is often a sharp “spike” of volume right at the start of the note, followed by a slightly quieter volume while the note is being sustained, followed by the volume fading down to zero when the note is released. The ADSR envelope lets you define this behavior by adjusting these settings differently for each of the 10 voices of the SKID chip. The Attack setting is a time, expressed in seconds (usually a fraction of a second), for how long a note takes to achieve its full volume in its initial first spike when it is played. Note that the volume achieved at the top of this spike is the voice’s default volume level. This time setting is not modified by tempo, because it represents the instrument’s physical properties that don’t change when the song goes faster. The Decay setting is a time, expressed in seconds (usually a fraction of a second), for how long a note takes to drop from its initial spike in volume down to its sustaining volume level. This time setting is not modified by tempo, because it represents the instrument’s physical properties that don’t change when the song goes faster. The Sustain setting is not a time, but a volume multiplier ( usually some amount less than 1.0 but higher than 0.0). It is the lesser volume level that the note drops to after the spike of volume defined by the Attack and Decay settings is over. The note will stay held here at this level until it is released. The reason this value isn’t a time setting is because the duration of this period of the note varies depending on the note being played. The Release setting is a time, expressed in seconds (usually a fraction of a second), for how long a note takes to fade from its Sustain volume level back down to zero again at the end of the note when the sustained duration of the note is over. This time setting is not modified by tempo, because it represents the instrument’s physical properties that don’t change when the song goes faster. This produces a sound that will suddenly start but ever so slightly fade at the end rather than dropping off immediately. There is just enough of a Release time to make the listener hear the sound as slightly less harsh than a fast cutoff would sound. Sustain = 0.0 (and it decays to zero, so you can’t “hold” the note). Release = 0.0s (Because Sustain is zero, this setting doesn’t matter). Release = 0.2 (and fades fairly fast when released, but not immediately). The SKID chip contains an interior lookup system that makes it possible, anywhere the chip expects you to give a frequency in Hertz, to instead specify its frequency using the more familiar “letter notes”. Mandatory: First character is the note letter, one of “C”,”D”,”E”,”F”,”G”,”A”, “B”, or “R”(to mean “rest”). Note that in all cases where you communicate a frequency to the SKID chip using one of these “letter notes”, the SKID chip merely converts these values into their equivalent Hertz value, and forgets the letter string you used after that. Thus if you set a Note’s frequency to “A4”, and then immediately query its Frequency, you’ll get 440 back, not “A4”. Note that if you form a string indicating an unknown note in this notation scheme (for example "E#5", when there is no such thing as an E-sharp), the resulting frequency will just be zero Hertz, the same as for a rest note. Defines which note you mean, i.e. which of the keys on a synthesizer keyboard. Be aware that if you set the frequency to zero, you end up with a note that is, essentially, a “rest”, and makes no sound. The frequency can also be expressed using musical letter notation. If you define both a Frequency and an EndFrequency, then the Frequency is merely the initial frequency the note starts at. The SKID chip can emit “slide” notes where the note’s frequency changes smoothly between a start and end frequency over the duration of the note without further intervention from the CPU’s program. To communicate to the chip that this is your intent, you can give it a note which has an EndFrequency value that differs from its Frequency value. When you do this, the note’s normal frequency value is merely its “start” frequency. The SKID chip will change the note’s frequency either upward or downward as needed depending on whether the EndFrequency is higher or lower than the initial frequency of the note. It will also change the frequency as quickly or slowly as needed to make the frequency reach EndFrequency at exactly the moment the note’s Duration runs out. (So giving it a shorter Duration makes it change frequencies faster). Defines how long this entire note lasts from the start of its Attack until the end when the next note can start. Note that by default, unless you choose to set the KeyDownLength (see next item below) to something other than the default, the note won’t quite fill the entire Duration, instead reserving a small sliver of the end of the Duration to represent the gap between this note and the next. Defines how long you imagine the “key” on a synthesizer keyboard is being held down for to produce this note. 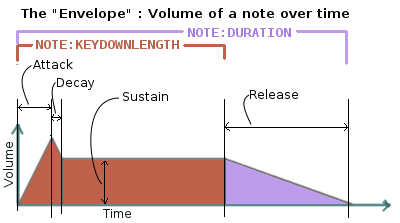 In terms of the ADSR Envelope, this is the time span that includes the Attack, Decay, and Sustain portion of the note, but not the Release portion of the note. The KeyDownLength must be less than or equal to the Duration (see above). If you try to set a KeyDownLength that exceeds the Duration, it will be shortened to match the Duration. Essentially the Difference between Duration and KeyDownLength is that Duration is how much time the note fills up of the song, and KeyDownLength is how much of that time is spent with the finger holding the “synthesizer key” down. The time between the end of the KeyDownLength and the end of the Duration is the gap of time from when one key is let go and the next key is begun. If there is no such gap, then two adjacent notes of the same frequency would just bleed together into sounding like one continuous note. By default, the KeyDownLength is slightly shorter than the Duration if you don’t specify it explicitly. The Release portion of the ADSR Envelope occurs entirely within the gap between the end of KeyDownLength and Duration. If you define the KeyDownLength to last the entire Duration, then you won’t hear the Release portion of the note’s envelope, because the note will cut off before it has a chance to start the release. A multiplier for the volume of this one note relative to the overall volume of the voice on which it is playing. By setting it differently per note, it’s possible to play a song in which some notes are quieter than others. This can go above 1.0 if the main volume is less than 1.0. But it is probably a good idea to make sure that this volume times the voice’s main volume doesn’t exceed 1.0 or you might get some “audio compression” effects that slightly distort the sound. The SKID chip allows you to set a tempo multiplier (a coefficient multiplier that can be a fractional number like 0.5, 2.0, 1.1, etc). This tempo multiplier causes all sound durations mentioned in specific notes to be sped up or slowed down by multiplying them by this number. It can be thought of as “how long is one second’s worth of sheet music going to last when played on this chip?” If you set it to 0.5, then each second’s worth of time in a Note’s Duration or KeyDownLength fields only lasts half a second for real, thus causing the notes to play twice as fast. Conversely, if you set this to 2.0, it makes notes take twice as long to play, thus slowing down the tempo. It should be possible to transcribe sheet music into the note format the SKID chip uses, by simply using a note Duration of 0.25 for “quarter note”, 0.5 for “half note”, 1.0 for “whole note”, and so on, and then setting the chip’s Tempo to set how long you mean for a whole note to last. It is possible to point the SKID chip at an array of these notes to make it play several notes back to back without further intervention of the main CPU. When the chip is given such a list of notes, it is a bit like feeding “sheet music” to the chip, and letting it play the song itself. This is where the settings such as tempo become quite relevant. The SKID chip will simply play the notes it sees in the order they’re listed, waiting for one note to finish its Duration before the next note is started. By changing the Tempo setting, you can speed up the song that is in the current note list without changing the definitions of the individual notes in the song. Note that any note with a frequency set to zero counts as a “rest”, which is useful to know when encoding a song into a list of notes. It is unknown if there is a limit to how long a list of notes can be. In our testing, the engineers haven’t discovered an upper limit yet. The SKID chip contains a flag that can be used to set whether or not it should start again with the first note in a list when it reaches the last note in the list. If this flag is true, then it will continue playing the song list forever and ever until made to stop. Note that even a single note counts as a “song” for the purpose of this looping flag. Yes, the SKID chip can play the same note over and over if that’s what you really want. Each of the 10 voices of a SKID chip can only play a single note at a time. But you may wish to transcribe some music into a song (list of notes) in which the notes of the sheet music contained chords - that is to say, cases where more than one note is supposed to be played simultaneously. The SKID chip can support this, but the way to do it is a little bit messy. In order to play something that has chords, you need to imagine that each of the SKID chip’s voices can be a different finger of a synthesizer keyboard player. Let’s say you want to play a song that has some 3-note chords in it. At minimum, a keyboard player would need 3 fingers to accomplish this. To do this with SKID, you’d need to dedicate 3 of the voices to the job, and make sure all 3 voices are given the same settings (Waveform, ADSR Envelope, Tempo, Volume, etc). With one of these voices, you play all the time, all the notes. (You give it a song that consists of all the notes in the sheet music). With the other two voices, you’d give them songs (note lists) that contain rests in all the places where there is only a singleton note being played, but then have them join in with with the extra notes to add to the main voice’s note in the places where a chord should be played. In order that you don’t need to send individual bits and bytes to the SKID chip, we’ve added a user interface in the Kerboscript language that interfaces with all these features for you. Keep the above technical specs in mind so you know what the settings you’re changing do. The documentation below is just a quick synopsis of how to use the kerboscript interface to SKID. To really fully exploit it, you need to follow the links below and read the detailed documentation on the Note structure and the Voice structure. The basic starting point of any Kerboscript program that works with the SKID chip is the GetVoice() built-in function. GetVoice(n), given any N within the range of 0 through 9 for the 10 voices in the SKID chip, returns a handle you can use to send commands to that voice of the SKID chip. GetVoice() returns an object of type Voice, that can be used to do everything else you need after that. If you take a moment to look at the documentation for Voice, you can see that almost everything it lets you do has a one-to-one correspondence to the hardware features mentioned above in this document. SET V0:SUSTAIN to 0.7. // 70% volume while sustaining. SET V0:RELEASE to 0.5. // takes half a second to fade out. // are "key down" time (i.e. the A,D,S part of the ADSR Envelope). SET N1 to NOTE("A4", 0.8, 1). // in the next octave up, over a time span of 0.3 seconds. SET N2 to SLIDENOTE("A4", "A5", 0.25, 0.3). Once a note has been constructed, it’s components are not changable. The only way to change the note is to make a new note and use it to overwrite the previous note. For that reason, it’s typical not to bother storing the result of a Note() or SlideNote() constructor in a variable as shown above, and instead just pass it right into the Play() method, or to make it part of a List of notes for making a song. The heart of the Kerboscript interface to the SKID chip is the Play() suffix method of the Voice object. You either construct a single Note and tell Play() to play it, or you construct a List of Note‘s and tell Play() to play them. V0:PLAY( NOTE( 440, 1) ). // Play one note at 440 Hz for 1 second. NOTE("A#4", 0.2,  0.25), // quarter note, of which the last 0.05s is 'release'. NOTE("A4",  0.2,  0.25), // quarter note, of which the last 0.05s is 'release'. SLIDENOTE("C5", "F5", 0.45, 0.5), // half note that slides from C5 to F5 as it goes. NOTE("R",   0.2,  0.25)  // rest.